The origin of the veil can be one of two sources, or a combination of both. Though the story never appears in Sacred Scripture, there is an ancient legend that a woman offered her head-cloth to wipe the face of Jesus on the way to Golgotha. When he gave it back to her, as the story has it, an impression of his face remained on the veil. What is now the Sixth Station of the Cross was legendary in Rome since the 8th Century. The name tradition has given to that woman is Veronica, a name that appears nowhere in the Gospel narrative of the Passion of Christ. 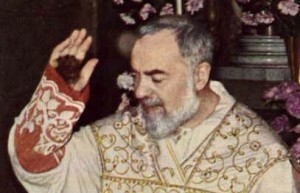 The two stories placed together – Padre Pio’s death and his prayer before the Veil of Manoppello – make perfect sense to me. In the hours before his death, Padre Pio contemplated the burial cloth of Christ. After fifty years of bearing the visible wounds of Christ, Padre Pio’s own soul sought out this visible link to Jesus beyond death; not Jesus crucified — a reality Padre Pio himself had lived for fifty years – but the image of the face of the risen Christ. It is true that a great burden carried for years can become part of who we are, such that we don’t even want the burden lifted because it has become comfortable. Victim souls such as these may “become like a glass filled with a clear light for eyes to see that can”, as Gandalf said describing the consequences for Frodo of his suffering. There is hope even at the beginning of the darkest, longest tunnel.